Close-up of Hunter Valley Cloak, (Wonnarua/Awabakal/Gamilaroi), in Smithsonian Institute Collection, Washington D.C.
Part of a common suite of assumptions which have characterised how history has been taught in Australian schools since the arrival of Europeans, is the idea that Australia’s First Peoples’ traditionally wore no clothing. Cloaks are also known to have been made of animals such as quoll, platypus, sugar-glider, and emu.The image of a proud warrior, either naked, or garbed only in a loin cloth, standing on one leg, overlooking the sea is an image that remains central in the imagination of many Australians when considering how First Peoples’ lived prior to invasion. It is an assumption which is dismissive of a diverse reality. For the vast majority of Aboriginal peoples across the continent, clothing took many forms, and was worn as the demands of the environment required. The colder climates of Tasmania, Victoria and the lower half of New South Wales and South Australia, saw people commonly dressed in full cloaks made of animal skins, covering from their necks down to their feet. Such cloaks could also be found being worn in Western Australia, the northern half of New South Wales, and into the lower half of Queensland, where warmer conditions ensured that they would be worn only on an irregular basis. Waist coverings were more commonly worn in these areas. Cloaks were traditionally made of a wide range of animal skins. 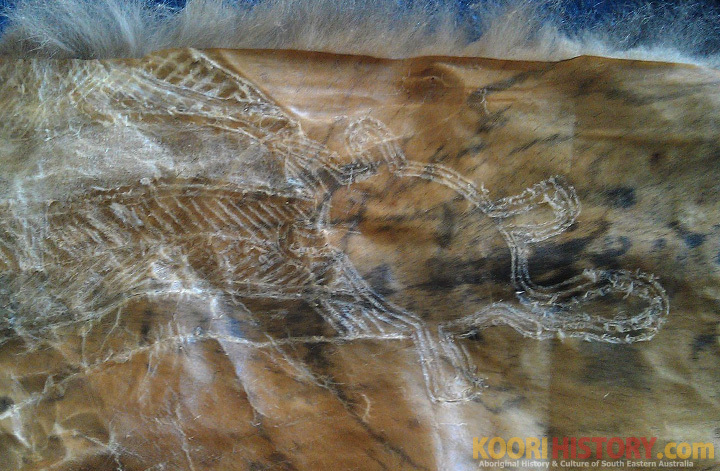 Koori people in Victoria and New South Wales preferred a possum skin cloak, whilst the Noongar peoples’ of Western Australia had a preference for kangaroo and wallaby. These preferences were shaped by the availability (or the lack of) of the animals in each geographic region. Cloaks are also known to have been made of animals such as quoll, sugar-glider, and emu. To produce a cloak the skin of a suitable number of animals was pinned to a flat surface, with any remaining flesh or membranes scraped off, before allowing the skins to dry. The pins were made of either wood or echidna quills. Traditionally, skins were not tanned, so cloaks were decorated with art to enhance the appearance of a cloak, and to add a higher degree of flexibility. Designs were etched into the leather using mussel and oyster shells, bone and stone tools. Once the designs were completed, in most cases a cloak was then painted, using ochre and black pigment. Artwork reflected a range of subjects, including a person’s identity, and representations of Country. To form a cloak, pelts were sewn together using thread made either from plant fibre, or animal sinew (these are tendons, generally obtained from either a kangaroo or emu). Today there are only a small handful of 19th century cloaks remaining, with a majority of these being held in overseas institutions. In some regions ceremony required that people were buried in their cloak, along with their possessions. The production of animal skin cloaks was discouraged by Mission managers and Government, and cloaks were replaced with wool blankets. In comparison, the blankets were ineffective in protecting a person from the cold and rain, contributing to the deaths of many Koori people in the eighteenth and nineteenth centuries. Leather exposed to the elements is not as durable as artefacts made of wood or stone. Cloaks would deteriorate and would be repaired, or replaced several times over during the owner’s lifespan. The oldest known cloak is the Hunter Valley cloak, which forms part of the collections held at the Smithsonian Institute, in Washington D.C. The cloak was collected in 1839-1840, is made of both possum and kangaroo skin and measures 146 by 125cm. In addition to cloaks, both animal skins and woven plant fibres were utilised in the creation of belts and simple coverings for the groin. 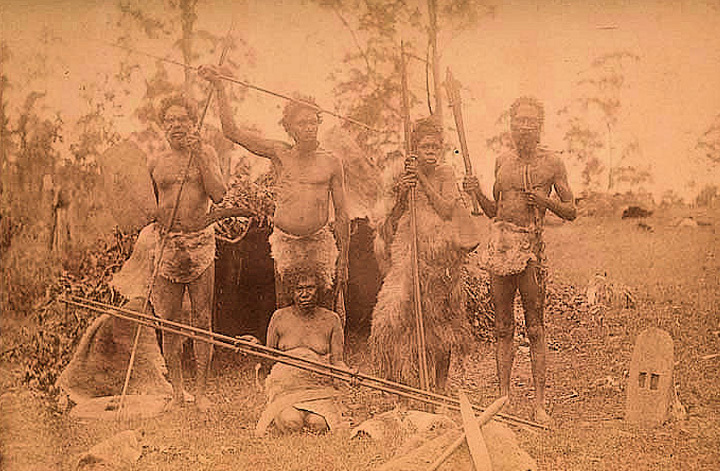 Such coverings were important in some of Australia’s traditional cultures, signifying in some instances the change in status of a boy as he entered into manhood. Skirts were made from a range of plant fibres, sometimes including human or animal hair, and in many instances were produced using an array of feathers, but with emu feathers being the most common. Today there is a revived interest in the production of animal skin cloaks, feather skirts, and other traditional clothing forms. The revival of possum skin cloaks as a form of cultural expression and pride began in the mid 1990’s and has since helped to inspire similar movements among people focused on revitalizing other aspects of traditional culture. Earth Pigments: Did Aboriginal people use Blue Ochre? Interesting read, thanks John. I find it remarkable that the so-called Hunter Valley cloak is not very old — only ‘collected’ in the time of my great-great grandmother. But then occupation of Aboriginal lands is not so old, either, is it? I’m glad that the cloak is still there for us to see (and will make a point of visiting it whenever I visit Washington DC). Also grateful that the craft and value of these magnificent pieces is being continued/restored by contemporary Koori artists and craftspeople. Previous story Earth Pigments: Did Aboriginal people use Blue Ochre?